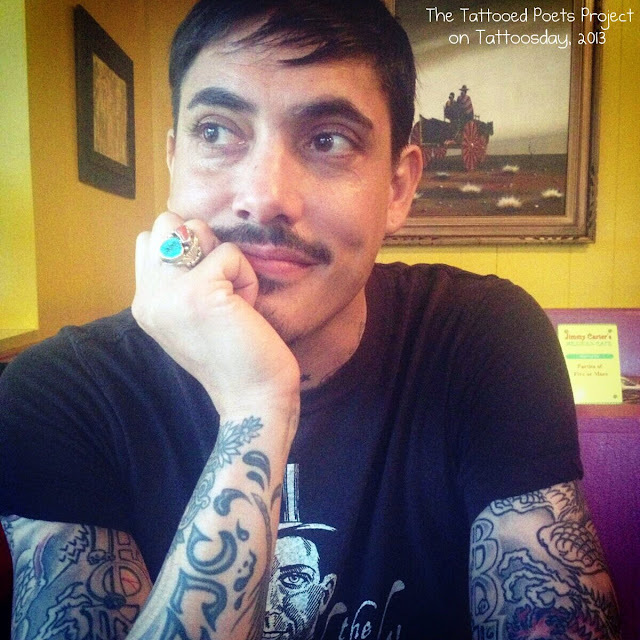 Our next tattooed poet is David Tomas Martinez, who hails from Houston. "It was difficult to chose just one tattoo for this blog post. I like to say I have 6 tattoos: my right arm, left arm, complete back piece, a neck piece, a chest piece, and a tattoo above my right knee. (I know, the obligatory random knee tattoo.) I also like to say that they are not tattoos but fortuitous birth marks. Nobody ever seems to accept these explanations." "Bryan Romero has done all my work. Other artists have touched my skin, but he has either covered their work or relined their work to incorporate it better in to our designs. Our process for tattooing usually goes like this: I text Brian and let him know I'm coming by. I discuss with him what ideas I have for my next tattoo. Mostly he thinks their good but once in awhile he will say that is impossible. Then, he draws it up over the span of a week or so. I look at it, making tweaks if any are needed. I usually defer to what he thinks, he being the professional. (I'm not sure if I am professional at anything.) We have been doing this routine for about ten years, when I first came to get 'home boy' tattooed on my biceps while wearing a cowboy shirt with roses on it. We quickly became friends, and I have lived in happy tattoo monogamy ever since. (Though I let him whore himself out to others.) He currently works at Sabertooth Tattoo in the Pacific Beach neighborhood of San Diego, California. Two identity forming states, identifying myself as a writer and Chican@, have really shaped my tattoos. For instance, I have a pistolera, or a lady gun fighter on my back, which is an homage to my ethnicity. But I also have a plume on my right forearm and a sword on my left forearm, a nod to Edward Bulwer-Lytton's saying, 'the pen is mightier than the sword.' And sometimes these two states of identity will intersect, in the form of a candy skull with a candle burning on top of it, a kind of Chican@ Shakespeare, or 'Chakespeare' if you will. My first collection of poetry, Hustle, will be published by Sarabande; the book is due out in May of 2014. This was quite an honor to have such a wonderful independent press putting my work in the world. My tattoo artist, Brian, has designed the book cover. As a way of solidifying this accomplishment, I can't hold the book until 2014, I got the book cover design tattooed on my leg. And for good measure I got Sarabande's logo tattooed on the side of my hand. My friend and mentor, Tony Hoagland saw the tattoo and told me, 'You're going to have a long career, you should slow down or you wont have any room for the other books.' By that I'm pretty sure he meant, 'Go work on a critical essay, then publish it.' Tony goes hard. Many of my tattoos mark some transition or accomplishment in my life. A sort of journal that everyone can read." "...please please please (best James Brown voice) do not just go in a tattoo shop, point at the board and drunkenly yell, "I want that one!" Because when I am waiting in line at the grocery store or, god forbid, a line for an amusement park ride that will take a month and I have to see your misspelled ex-boyfriend's name, or a heart with Budweiser on the scroll, or Rainbow Brite with blood shot eyes and a joint in her hand, I will be angry. Don't do that to us. Think about what you want and pay your tattoo artist according to their worth. I have too many friends that have too many horror stories about getting tattooed. Do not be one of these people. Do your research." The poem David sent us has a tattoo in it, as well. 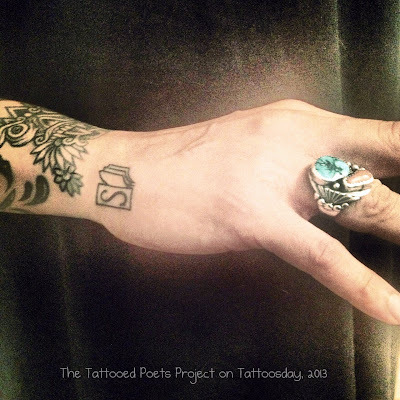 "The poem I picked, 'Coveralls' has an important 'scene' where my coworker, Lucy (and let us not forget the Latin root, luz, or light) shows me a tattoo she had." He adds, "I hope you enjoy the poem and I am glad to be apart of this wonderful jamming of two of my favorite passions! Writing! Tattoos!" When not writing bios or sonnets in bathroom stalls, David Tomas Martinez lurks along the San Diego trolley lines giving hugs to the homegirls and daps to the homeboys, all the while remarking how the cigarette butts on the ground look like petals on a wet, black bough. His work has been published in Forklift Ohio, San Diego Writer's Ink (Volumes 2 and 3), Charlotte Journal, Poetry International, and he has been the featured poet for Border Voices. He is a Ph.D. candidate in the University of Houston's Creative Writing program, with an emphasis in Poetry. Martinez is also the Reviews and Interviews Editor for Gulf Coast: A Journal of Literature and Fine Arts. His debut collection of poetry, Hustle, will be released in 2014 by Sarabande Books. Thanks to David for his extensive share of poetry and ink with us here on Tattoosday's Tattooed Poets Project!